Few will refuse to have their own swimming pool. Artificial pond, enabling you to relax at any time of the year - if it is closed - or only in the summer, is a great temptation for owners of country houses. However, it should be noted that the device pool - it is a time-consuming and costly process, which must take into account everything from literacy project construction, ending with what will be the bowl for the pool. After thorough preparation of the draft pool,You can carry out his device, starting with the digging of the pit for the base of the hydraulic structure. Excavation is carried out using an excavator to the desired depth. Typically, this depth is calculated from the height set by the swimming pool, plus an additional 20-30 cm. With regard to the length and width of the pit, they should exceed similar parameters to the pool of 50-60 cm. This measure is necessary for the installation of high-quality and efficient waterproofing construction and formwork. When will the stage of digging the pit, you canproceed to clean the bottom of it. To do this, manually remove the extra roots, leveled surface of the walls and removed the excess soil. 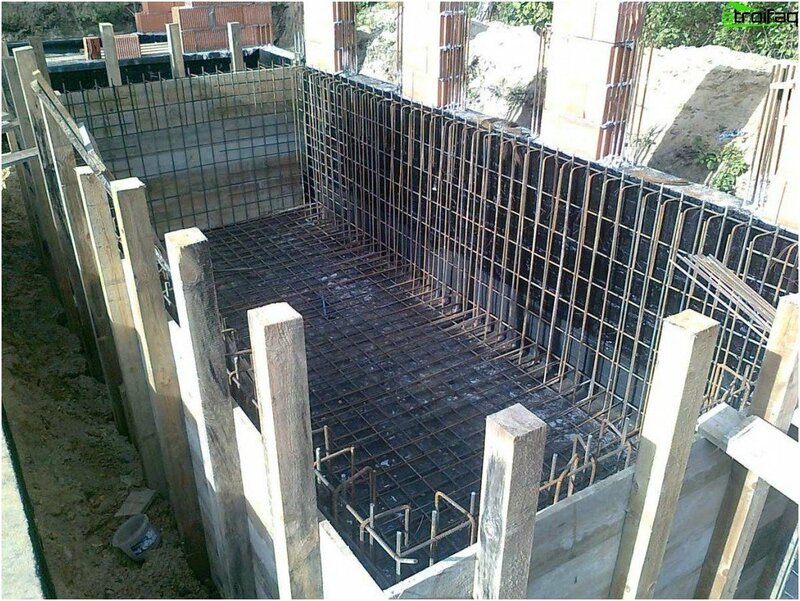 The condition of the soil in which the foundation is laid for a pool, you should pay particular attention to: if it is not loose, and its depth is not more than 1.5 m, it is possible to neglect the strengthening of the walls of the pit. After that, the bottom of the pit is covered with a specialbedding of sand and gravel. Its thickness is approximately 20-40 cm in average size of gravel and sand fractions. Implemented by laying several such bedding layers 5-10 cm, before each subsequent laying tightly compacted. This plays a role in all the bedding groundshydraulic structure. Then, the concrete screed for leveling of the base surface, the thickness of which is in the range of 10-15 cm. After that, the foundation for the pool can be regarded as fulfilled. In the next step carried outpreparatory work for the future installation of bowls swimming pools - Installation of formwork and installation of the frame reinforcement. It is worth noting that to date, the pool are presented in a fairly wide range. Depending on the material manufacturing and operating characteristics of the bowl requires the implementation of certain preparatory work. It is worth paying attention! As for the base unit to the indoor pool, the complex of works will depend on whether the pool is being built at the stage of building a house or being introduced in the already existing structure. In the first case at the design stage of the house you can take into account all features of the hydraulic structure. In the second case it is necessary to develop individual technological scheme, since there is a risk to undermine the support of the apartment building, which can lead to serious deformation. At the time of the bowl for swimming pools,offered to consumers meet the tastes of even the most demanding ones. The choice of a bowl is typically based on a variety of factors, not least of which plays its cost, durability and need repair. For example, a classic option is a bowl of concrete. 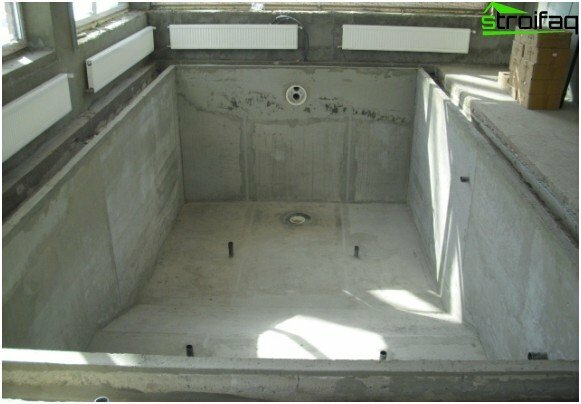 Bowl of concrete pools is carried out afterimplementation of a number of works, including the installation of fittings and installation of the formwork, which allows us to give the desired shape the future of the basin. Only after such a framework for the pool is made, it carried out concreting the bowl. It concreting often carried out in two stages: first, the bottom is filled, and then - the walls. It should be noted that the bowl basin made ofConcrete has many advantages. Thus, the waste of the years the technology of its manufacture allows to obtain high-quality and reliable results. 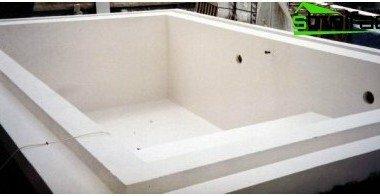 In addition, concrete formwork allows you to fill in any form, that is, it is possible to build a pool of any desired configuration. Of particular importance is the fact that the pool of concrete bowls device can be carried out even with high groundwater level. Thus, the concrete pool deck is one of its structural elements, requiring a careful approach to the device. So bowls in the factory or give theanother form. For consumers, they get ready-made, that is, this cup do not have to collect. Due to its light weight plastic, such bowls easily transported to the device pool. Plastic basin bowl currently extremely popular, as different environmental friendliness, safety, ease of installation and maintenance. It is worth noting that manufacturers bowlspools made sure to satisfy the tastes of a wide range of customers, as it offers a huge number of products of various shapes. 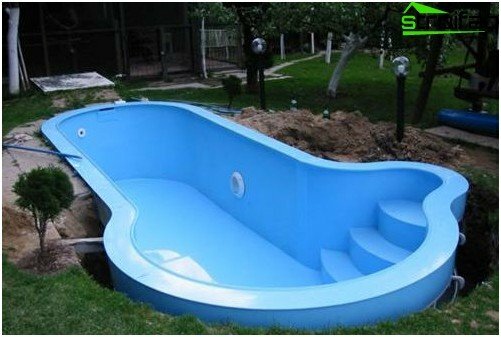 Thus, the plastic bowl for swimming pools can not only be oval or rectangular, but rather to take the original shape. 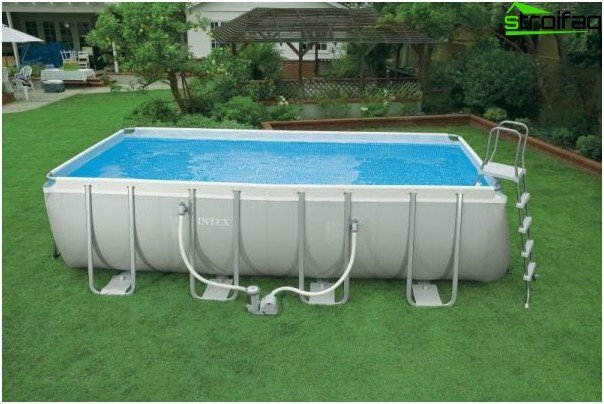 Polypropylene pools every year is becoming increasingly popular, thanks to the combination of quality and quite democratic prices, which makes these pools accessible to the public. Bowl basin is made from polypropylene by welding of several sheets of material. The finished product is characterized by integrity,strength, the ability to avoid additional finishing pool, resistant to temperature fluctuations, water, air, durability and aesthetic appeal. In some cases, the device majorpool recessed into the ground is not possible. This may be due to a variety of reasons, such as the state of the soil, lack of money or a small area of ​​land. In such a situation it is possible to find an excellentalternative, which will serve as a frame pool. It looks just like a big bowl of the pool that does not require installation for the digging of the pit and lay the foundation. Such a pool on the frame can be installed anywhere on the land. It easily can be assembled, disassembled and moved from place to place. 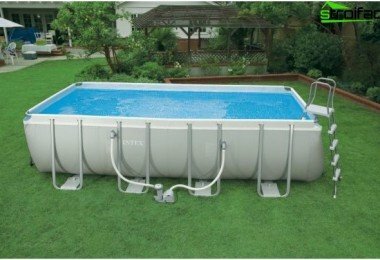 The light weight of the assembled pool allows you to take it on the nature or move to a shady spot. Prices for frame pools are quite acceptable, care is simple and operation - comfort and safety. 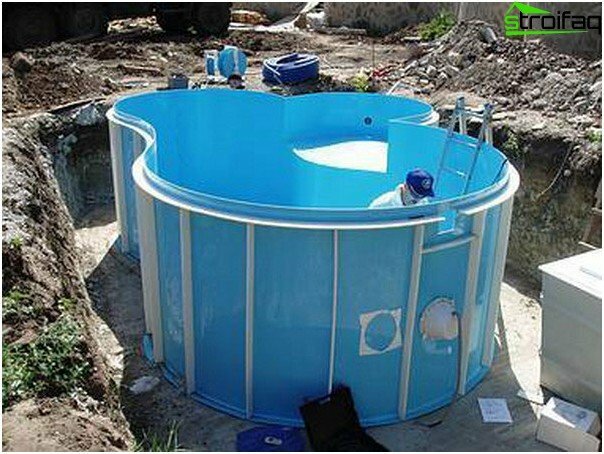 Thus, today, one can easily determine the necessity of arrangement of the pool in a country house, to examine their technology devices and select the desired manufacturing materials.